We recently released four free apps for students, teachers, and administrators to be more productive with their mobile devices in school. We thought it would be a good idea to provide more details on how we built these apps with AppSheet so you can tweak and build your own apps for school, work, or life! We designed this app for a graphic design professor to give to her students. The app contains all course assignments as well as the PDF files associated with them that students can download via the app or the web browser. 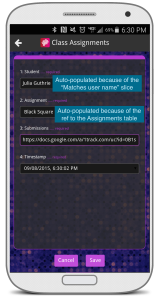 Track and download homework assignments. The Tasks view shows all assignments in order of when they are due. 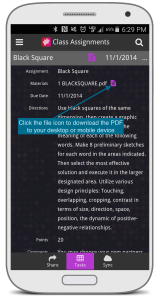 Within any assignment, clicking the little file icon next to each assignment in the “Materials” field allows you to download the assignment to your phone as a PDF. Submit assignments. Each assignment has a “Submit” field, which is actually a reverse ref to another table I’ve included in the app. 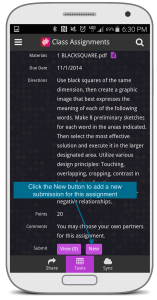 Clicking “View” allows the student to view past work they’ve submitted for that assignment. Clicking “New” takes users to a new page where their names are autofilled in (because we’ve required user authentication), the corresponding assignment is auto-chosen from the a dropdown menu, the student can submit a document link, and where the timestamp is auto-recorded so the professor knows when the work was submitted. View past work. As described in the last item, students can click into individual assignments and hit the “View” button to see their past submissions for that particular assignment. Ref-- We created a reference between the column “Assignment" in the Submit table and the "Assignments” column in the Assignments table. We did this by going to Advanced Editor > Data > Column Structure, selecting “Assignment" and then changing its type to “Ref". Now, when a student adds an assignment, the Assignment will be auto-populated with a drop-down menu showing the corresponding value from the course menu. In this case the student will add her assignment’s Google Doc web link to the Submissions field. Slice-- We created a slice in order to display past assignments solely for the user who is signed in (since the professor does not want students to be able to view others’ work). We did this from Advanced Editor > Data > Slices. First we named the slice “Student Work”, then chose the source table (which is the Submit table), and made sure the update mode was “ADDS_ONLY”. Then we added the filter column, which in this case is Student. The correct filter condition is “Matches the user name”— this ensures that the app will only display submissions that match the current signed in user’s name.